Modern conflicts frequently require small regular forces to prevent intrusions or attacks by irregular forces that move stealthily at night or over remote terrain. Regular forces must simultaneously protect their own very vulnerable bases and monitor a huge area of possible infiltration. These challenges have required a wide variety of unmanned surveillance devices, in the air, on the ground and even under the seas. One type of equipment, unattended ground sensors (UGSs), has been particularly important. UGSs can use a variety of detection and identification techniques. They can focus on individuals, vehicles and other equipment. They may operate in standalone mode or be combined in intricate networks of sensors to cover wide areas. And UGSs can be light and cheap, designed for temporary tactical deployments, or sophisticated and more durable, for more permanent placement. In any case, as with other unmanned devices and sensors, technology is improving constantly and defense forces becoming more demanding. These virtual sentries are getting smarter all the time. Product Manager Ground Sensors in the U. S. Army’s Program Executive Office for Intelligence, Electronic Warfare & Sensors (PEO IEW&S) manages the Expendable Unattended Ground Sensors (EUGS) system, which is deployed throughout Afghanistan. EUGS uses inexpensive, expendable sensors, capable of seismically detecting and reporting human footsteps and vehicle traffic. It can provide persistent surveillance and early warning of enemy activities in remote areas of interest. EUGS is a near real-time situational awareness system that is simple to deploy, operate and transport. Detection reports are transmitted directly to a compact base station in one configuration or to aerostats via a radio-frequency link. EUGS consists of a base station and kit of 55 expendable sensors. Based on the success of EUGS in Afghanistan, the U.S. Army approved it as an Acquisition Program Candidate and tasked the Electronics and Special Developments Branch of the Maneuver Center of Excellence-Soldier Division (MCOE-SD) to develop a capabilities production document for a new Army UGS. The MCOE is in the early stages of developing this document. In December 2014, Army Contracting Command, acting for PM Ground Sensors and the MCOE, requested information from industry on a better UGS. The Army wants a system of buried detectors, a receiver, soldier-carried display, cabling and antennas. The improved UGS would last at least four months doing 50 daily detections on off-the-shelf batteries. And the new UGS should detect low-flying aircraft and tunnel diggers along with personnel and vehicles. In addition, the Army wants sensors that weigh less than 10 ounces and cost less than $500. Vendors have been active in improving a variety of UGSs. For example, EPE distributes in Australia and New Zealand the next-generation of EUGS, Pathfinder, developed by the U.S.’s Applied Research Associates. ARA sells EUGS and Pathfinder directly to U.S. and other customers. A seismic UGS to detect humans, Pathfinder incorporates lessons learned in Afghanistan and Iraq to be “the most cutting-edge footstep detection sensor on the market,” says EPE Intelligence, Surveillance and Reconnaissance Manager Dean Dickson. “Pathfinder is the world leader in expendable, affordable and undetectable security and protection.” The primary user of Pathfinder to date has been the U.S. Army. Pathfinder sensors capture movement, and their effectiveness thus depends on how well users understand threats. The more users know about how threats operate, the more Pathfinder will help determine intent. Pathfinder deprives threats of surprise and maneuvers by covertly detecting, identifying and monitoring activities, movements, route networks and key locations. Users can then choose when and where to interdict threats, apparently by accident so adversaries do not know they have been observed. Dickson says Pathfinder has been successful in military operations, border security, fighting narcotics trafficking and terrorism, protecting infrastructure, controlling refugees, private security, searches and rescues. Pathfinder success in remote areas is partly due to radio communication that transmits information over ground up to 15 kilometers and in the air over 25km, packaging data to be undetectable to frequency-spectrum analyzers and similar equipment. And open architecture facilitates easy integration with ISR tools for slew-to-cue, fly-to-cue and cue-to-target functions. 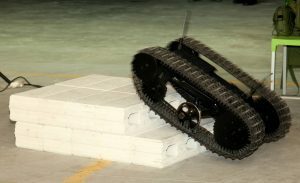 The newest Pathfinder incorporates a number of improvements: miniature and extra-large variants; extended battery life, up to eight months for the mini and 24 months for the extra-large; machine-learning algorithms; better signal processing for better detection and fewer false alarms; and a micro-receiver for mobile, dismounted operations. This new micro-receiver can display all information on any Android or iOS device, including the Android Tactical Assault Kit and iPhone Tactical Assault Kit. Users can scan Pathfinder sensors when emplaced to populate data such as GPS location and later access data such as sensor status, performance, detection, and distance to threats. Dickson stresses that Pathfinder’s radio communication enables long-range transmission, even in non-line-of-sight and beyond-line-of-sight urban, rural and other conditions, without gateways or relays. Pathfinder is also quick and thus safe to emplace. And the device is both low cost and expendable, yet has an extended battery life. ARA hopes to add more capabilities in the coming year. Programmable detection radii would allow users to push a button to tailor detection radii for mission requirements. ARA wants to improve machine-learning algorithms to make Pathfinder smarter. And it is working on algorithms to detect not just people, but vehicles such as all-terrain vehicles. Digital Barriers offers the Remote Detection and Classification sensor. RDC is a battery-powered, wireless sensor for detecting both intrusions by people at distances from 20 and 70 meters and intrusions by vehicles up to 100 meters, and classifying the intrusion as one or the other. Marketing Director Maria Clutterbuck says RDC has high detection rates and low false-alarm rates, proven in many different environments for different applications. Weighing less than half a kilogram, RDC is also, “highly portable, and quick to deploy and set up,” Clutterbuck notes. For communication, its self-forming, self-healing mesh network is field-proven over many years of operation and extremely reliable. It has a long battery life, four to six months on a single D cell, requires low power for radio communications and is designed to be very robust. Distinctively, RDC uses an internal antenna that performs as well as an external antenna but is more robust and covert when deployed. “Nodes can be deployed just below ground level for complete concealment,” Clutterbuck says. And communication over an internal, rather than external, antenna eliminates vulnerability to wind, which can reduce detection and increase false alarms. RDC’s sensor node also has a unique screw-thread design that secures the node in the ground, which reduces susceptibility to wind movements. And it makes unauthorized removal difficult. “A special tool is required to deploy and remove it,” Clutterbuck explains. RDC can work with other firms’ UGSs. Other UGSs can be integrated into a radio network with RDCs to create a multi-sensor UGS System. And RDC is fully integrated with Digital Barriers’ real-time wireless video technology for triggering surveillance cameras to provide users with visual confirmation of alarms. RDC does not use a geophone for its seismic sensor. Thus the device is less susceptible to electromagnetic interference and more robust and less sensitive to its orientation than geophones, which require near-vertical orientation. The Digital UGS has a special capability to detect digging, enabling it to distinguish between someone walking past the node and someone digging nearby. And its radio has a silent mode that renders it undetectable by listening devices until there is a report of intrusion to be transmitted. Elbit focuses on a mix of different sensors, including acoustic, seismic, magnetic, radar, infrared and daytime cameras. It also integrates these sensors in a network that can communicate, coordinate and correlate sensor data and thus provide operators with the most relevant information, as automatically as possible. Elbit’s Primrose UGS system does this with an emphasis on light weight and the ability to detect, locate, track, identify, classify and target threats, in environments that can vary from jungles to urban terrain and even major cities. Kesting says Primrose works in all weather and electronic conditions. And it can work against a variety of threats, from ground to air to the newly important subterranean threats. Primrose makes use of a self-forming mobile ad hoc communication network and a set of sophisticated algorithms that aggregate, correlate and mine sensor data so only the most important information is sent to operators, increasing detection and reducing false alarms. Managing and exploiting each sensor correctly helps minimize power requirements, and the system is easy to set up. Each sensor has its own range, but the power of the network approach is that the system can cover areas from a few square yards up to many square miles. If one sensor fails, the network simply reconfigures itself to compensate for the loss. Primrose is a tactical system, with battery life of about a month. Elbit devotes a lot of attention to managing sensors and communication to maximize battery life. For example, using power-hungry cameras only when triggered by low-powered sensors saves battery life, as does minimizing redundant coverage of areas. Primrose has been deployed by non-U.S. forces, and Elbit is now working to integrate it with U.S. Army and Marine systems. It can work with other sensors or sensor systems. Elbit keeps a sharp eye on new or improved sensors for integration into Primrose. Kesting says the ability to detect subterranean threats is an increasing challenge for all UGSs. He acknowledges that Elbit is not alone in its network approach to detection, but believes his firm is especially strong in managing networks and in developing the algorithms that discriminate between real threats and nuisance alerts. Northrop Grumman now offers Scorpion II, which it calls “the next generation of persistent, autonomous surveillance for force protection and intelligence gathering.” Scorpion uses seismic, magnetic, infrared, long- and short-range thermal and day cameras as well as point-blank-range cameras. These last are very small, which allows them to be very close to the threat while remaining concealed. The latest Scorpion has a battery life of more than six months, produces high-fidelity digital images, uses wireless ad-hoc networked sensors and can do long-haul communication over an Iridium satellite link. Local wireless burst communication is used for real-time threat assessment. Northrop argues Scorpion is well-suited to protection of deployed forces, forward operating bases, borders, perimeters and critical infrastructure and can help defeat improvised explosive devices. Scorpion can both detect and recognize targets and works in cities, jungles, deserts or mountains. Point-blank range day and thermal cameras are optional on Scorpion as are the passive infrared sensor and pan-and-tilt electro-optical camera. A Combined Adaptive Sensor Transceiver, or CAST, combines data from seismic, magnetic and infrared with a two-way line-of-sight transceiver in a buried package, detects and classifies targets up to 100 meters away and then cues optical or infrared sensors up to two kilometers away. These latter sensors then provide actionable intelligence and GPS locations for targets up to 1.2km away. In early 2012, the U.S. Army awarded Northrop an indefinite delivery, indefinite quantity contract to provide an earlier Scorpion and the latest Scorpion II systems over a five-year period. Domo Tactical Communications has just launched the latest generation of its Nugget line of UGSs, explains Tim Young, vice president of solutions. Nugget consists of one or more UGSs that can form a wireless mesh network for triggering, alarms and communication among all network sensors and back to a monitoring station running Domo’s Mission Commander application. Each Nugget UGS has a geophone to detect seismic vibration, the ability to detect tampering and a trip wire that can detect passage along a path. Each nugget can be connected to up to 16 other sensors, such as passive infrared, magnetic and external seismic, and can trigger daytime and extreme low-light cameras. External sensors can confirm targets within Nugget’s vicinity. Sensor Nuggets relay alarms through Network Nuggets to a Destination Nugget connected to Mission Commander on a handheld device, giving operators exact locations, times, dates and trigger types of event. All Nuggets are ruggedized and designed for long use. Domo makes Nugget and the communications and algorithms that form the network. It can integrate third-party or customer sensors, including long- and short-range passive infrared, seismic, magnetic, make-break and pressure sensors. Regular updates can be sent Mission Commander, as each sensor sends in confidence signals. Network Nuggets can receive wireless alarms from up to 32 external sensor transmitters on each of two channels. Nuggets operate up to 90 days on two lithium D batteries. Bi-directional mesh interface lets users enable or disable extra sensors. Each Nugget has a GPS that reports location upon deployment. Trigger events and parameter changes are kept in Nugget’s electronic log. Communication may be constrained when devices are buried in threat areas, but mesh enables messages to be sent tens of kilometers. Exensor works with a mix of its own UGSs and third-party sensors and cameras, explains CEO Christian Gravengaard. Exensor UGSs come in two versions. There is a seismic-acoustic-magnetic UGS designed to detect and type-identify vehicles such as tanks by recognizing their magnetic signatures. This UGS is meant to monitor passage points and has a range of 15 to 20 meters. Exensor’s other UGS, an acoustic-seismic UGS, detects and classifies humans and vehicles from civilian cars to heavy trucks. It is designed for monitoring areas and has a normal range of about 50 meters for persons, up to 200 meters for normal vehicles and up to 500 meters for heavy vehicles. Effective ranges depend on the nature of the ground. Exensor also makes passive infrared sensors and a range of cameras. Different lenses and dual or single camera heads enable the use of black-and-white images, thermal images, daytime color imagery and wide or narrow coverage, according to user requirements. Exensor can integrate these devices and other devices already used by customers or supplied by third parties, including radar sensors, into its own mesh network, developed for Sweden’s equivalent of the U.S. Army’s Future Combat System. Open architecture allows integration into other communication and command and control systems as well. Exensor offers tablets and personal digital assistants to control and monitor UGS results. Gravengaard cites Exensor’s many happy and loyal customers over 30 years of UGS usage. He stresses that UGSs are Exensor’s main business. “This is our life.” Exensor UGSs have been used by forces in Europe, Asia, Australia and in special programs in the U.S. The Exensor CEO also emphasizes that his company has long experience in integrating third-party equipment in live operations, not just in theory. Exensor minimizes false alarm rates to ensure UGS results are useful in the field. And its network ensures cameras can be triggered by sensors with minimum delay. The company is now working with five leading customers to further enhance its UGSs and system. It will soon launch new UGSs that are smaller, lighter and more durable and that use even better algorithms. “We do not compromise on intelligence,” Gravengaard stresses. He argues inexpensive and disposable sensors do not meet most operational requirements. Exensor strives to upgrade UGS software to improve performance of UGS hardware so that older devices can continue to be used. Jay Chesnut is now CEO of Innovative Algorithms, a service-disabled, veteran-owned small business. Chesnut spent 30 years in the Navy, working with sono-buoys for anti-submarine warfare, served as director of innovation for the Supreme Allied Commander of Europe and spent time in Colombia and Afghanistan reviewing performance of UGSs. Phalanx Shield currently includes four versions: the expendable X3, the compact X3-ER with extended range, the Q5 with increased performance and the Q7 for longest life and best performance. Models differ chiefly in size, the distance they can detect movements and battery life. For example, the 15-ounce Q5 can detect bipeds at more than 125 meters and lasts 18 months on one D cell lithium-ion battery. All models use the latest communication technology on the market and can wirelessly pass an alarm over 15km with no backhaul. “We designed a very simple UGS, a small box,” Chesnut stresses. “You put it in place, turn it on and that’s it.” Innovative is now working on making its Phalanx series even more mobile, as Chesnut notes soldiers do not want additional weight and burdens.